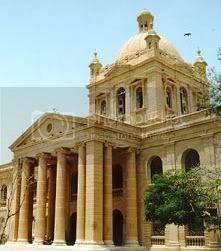 Rivalry between Karachi’s two prominent science colleges; Adamjee and Dyaram Jethmal (DJ) goes back many decades. DJ college was founded in 1887Â and is named afterÂ the famous Sindhi philanthropist, Mr. Diwan Dyaram Jethmal. Adamjee College was founded in 1955 by Pakistan Memon Educational and Welfare Society. Both colleges compete each other not only in academics but also in sports. Photo of DJ college’s front facade is given to the right. While both colleges boast of great talent in academics and sports, DJ college gets the best of two in cricket. However, for at-least one year in 1989, Adamjee College was able to beat DJ College comprehensively. This writer had the honors of playing for Adamjee College that year. According to 1989’s Inter-Collegiate draws, Adamjee versus DJ match was scheduled at Bakhtiari Youth Center (BYC)‘s B Ground. 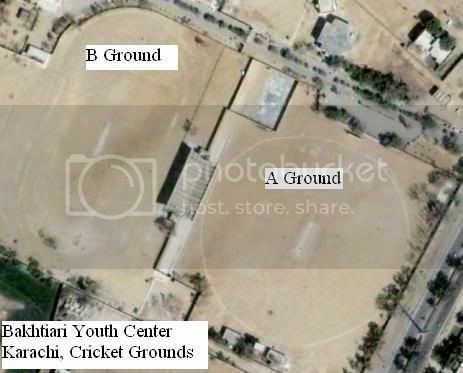 Youth Center is the same ground to which Imran Khan had once called the Graveyard of Fast Bowlers. Look at the photo below. It shows both A and B grounds of BYC. From the desert like conditions of both grounds you can tell they are indeed a graveyard for fast bowlers. On a chilly January morning, Adamjee’s captain Junaid Shamim won the toss and we elected to bat. Our opening pair was Naved and Anwar. Both were deeply influenced by the opening batsmen philosophy of Pakistan at that time. If one copied Mudassar Nazar to the end, then other considered Shoaib Mohammad as his ideal. Both of them were in competition to see who plays the most number of maiden overs. Our good luck prevailed and both of them got out around fifth over. Qamar-ud-doja and Junaid Shamim then took DJ’s bowling to the task and Adamjee’s run rate finally crossed 3 per over. Junaid was especially in good form that day and pulled at-least 2 sixes to the top of the roof of main enclosure of Youth Center. Again refer to the photo above. It shows the location of main enclosure between A ground and B ground. After Qamar and Junaid got out, Adamjee had a couple more aggressive batsmen in their bag. These hard-hitting gentlemen used to play cricket like baseball and tried to hit every ball as if pelting cotton in a quilt (dhunaai). Our innings continued with ups and down. The score reached 150 in 38th over and we lost our 7th wicket. That’s when I came in to bat at number 9.Â DJ college brought a very complicated type of bowlerÂ to bowl the 40th over. He used to run 16 steps and then bowl a mixture of slow and medium delivery. I was stuck at the non-striker’s end until the last two balls of the 40th over. The fifth bowl of the over came, I heard a doppler effect shoooooN sound, the ball spun almost a foot and went to the keeper. Everyone in the pavilion started shouting and telling me how to plaw the next ball. Since the ball was spinning by feet, I made up my mind to hit next one on the up before it could spin. The last bowl came. It was pitched off-side the off stump. I got my timing right and on front-foot smashed a cover drive to boundary. 17 years have passed since then, but to date I feel the enjoyment of hitting that cover drive to the boundary. That also brought Admajee’s innings to end. We had scored 164 for 7 off 40 overs. I was not out at 5. My batting average also increased by a fraction as I remained not out in this innings. Lunch was then taken (not served). As we go for the lunch, I want to take a quick detour from the match and show the location of Adamjee College. 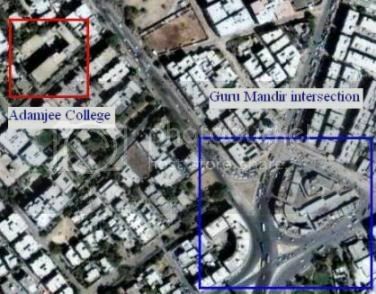 In the image below, the blue rectangle shows the location of Guru Mandir which is a well known Karachi landmark. From there one has to follow the Business Recorder Road to reach the red rectangle which shows Adamjee College. Now back to the match summary. All our matches in 1988-89 season were scheduled at Youth Center.Â During lunch breaks we used to walk to one of the infinite branches of Cafe’ De Khan (Cafe’ of the Khan) located across the road in Block-A of North Nazimabad. nihari, qorma, tandoori roti, and cups of hot tea used to be our lunch menu. After that nobody wanted to field for 40 overs. But that day our moral was so high that we just ate daal (lentils) and roti (bread) so that we can have a go at DJ batsmen in the afternoon with full energy. When we reached the ground, sea breeze picked up its gust. Karachi’s sea breeze is always very strong in the afternoon and brings with it humidity, which makes cricket ball swing naturally. It is always an advantage to field in the afternoon in Karachi weather. I started first over with the breeze (KDA ground end) and Junaid Shamim started bowling into breeze from the S-Block end. He was right arm and I am left arm. We swung the new ball so much that DJ batsmen were literally dancing in their crease and were still unable to touch the ball. Junaid got first batsman out plumped in front of the wicket and I got another one caught behind. We bowled 10 overs unchanged and let DJ score only 20 for the loss of 2 wickets. From 11th over our spinners took over. I don’t remember much detail after that, because I was fielding at the deep square leg boundary waiting for my next spell. DJ batsmen however, kept losing regular wickets. Around 30th over or so, a DJ batsman tried to pull one of our spinners. The ball got top edge of the bat and went so high up in the sky, that in cricket terminology we call it ‘ball taara ho gayee’ (ball became a star). 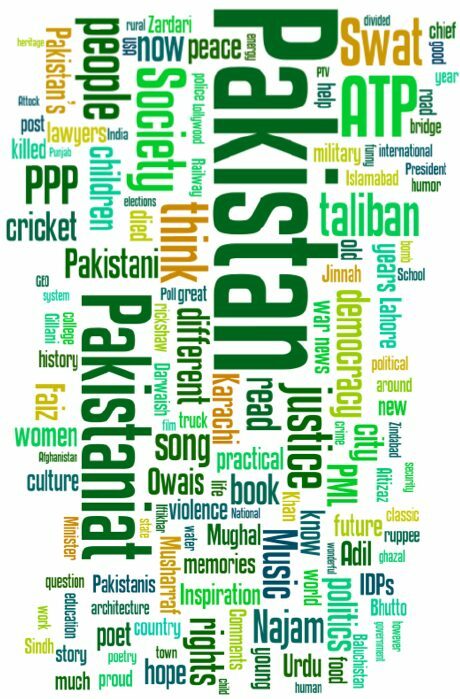 I do remember some people shouting my name and calling for catch pakRo (catch it), shabash (bravo), dauRna (run) , pakaRna (grab it) etc. My eyes were trans-fixed on the ball, which had gone miles high up in the sky. As it came down, I somehow got my hand and eye coordination right and caught it inches inside the boundary line. That catch was another memorable event for me from that match. After 35th over, I came back to bowl again. By then, DJ’s tail-enders were playing. Junaid and I quickly wrapped up their batting and DJ got all out for 110 or so runs. I finished with 3 wickets for 18 or 20 runs. 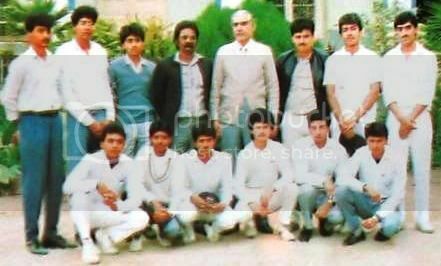 Following is the photo of victorious cricket team of Adamjee from 1989 season. That victory earned us a spot in quarter-finals, which we played against Government Commerce College and lost. But that story some other time.